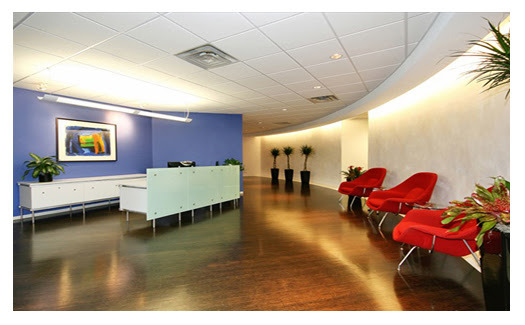 New Coat Painting Professionals (Painting Contractors) provides top-notch commercial interior and exterior painting services for office suites and office complexes. These projects range from complete renovation, remodel coatings and wall coverings, to tenant finish projects, and maintenance touch-up service contracts. We understand that not all business owners are property owners. Many of the projects we get involved with are for the end user of a property owned by others. We work hard with all parties involved to ensure that the finished painting project is something we can all be proud of. We strive to understand the goals of the property owner and combine those with the needs of the tenant. Communication is a big part of the equation for success in this situation. We take pride in the fact that the staff of New Coat Painting Professionals (Painting Contractors) is detail-oriented, and will provide you with clear communication from inception to completion. This high level of communication is key to ensuring your project becomes the reality of your dreams. We draw from our team of experts to craft a custom solution to your particular needs. Your project team will feature key players who are familiar with your needs. Whether you're breaking ground for the first time, renovating an existing space, or merely preparing for the arrival of a new office tenant, our performance will surpass your highest expectations. Whether it's paying attention to the unique details of your office environment, or going beyond the call of duty to support a special building event ,New Coat Painting Professionals (Painting Contractors) aims to please. We are eager to do whatever it takes to keep our customers satisfied. Our company's many years of quality professionalism and friendly face-to-face service make New Coat Painting Professionals (Painting Contractors) commitment stand out as "a clean above the rest."